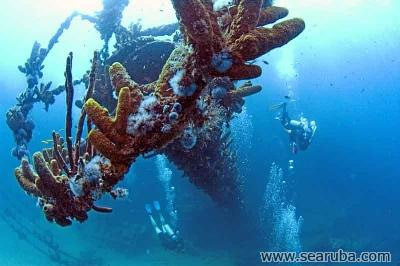 I'm talking about the shipwrecks that offer the best reef snorkeling views available under the sea! 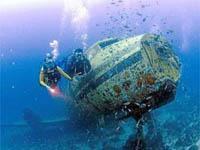 Aruba specializes in undersea shipwrecks of all kinds. 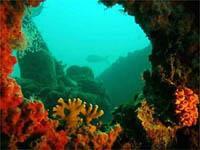 And if you don't know, shipwrecks are loved by coral and reef fish! As long as the ship has been underwater for a certain amount of time, the reef grows all over it. See Videos Below! I don't know the specifics of reef development. But I imagine that the ships have to be in somewhat sheltered water (or create their own shelter) and must be close enough to the surface for sunlight to penetrate. In Aruba, most of the ships crashed near the existing reefs. Some of the ships have masts that stick out above the water. There are old sailing ships, navy-type ships and even a plane or two laying around Aruba. It is a snorkeler's dream. This shipwreck is the famed "Ghost Ship", or the Antilla, a German freighter that is the largest wreck in the Caribbean (400' long). It sunk when it was brand new! 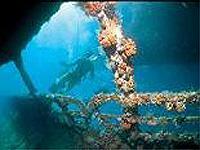 The wreck is excellent for penetrations because of its large compartments. See videos below! Now, you can see the compartments from the surface, and boy is it ghostly! Open doorways lead to black tunnels. Part of you will want to swim away and the other will want to dive down. But, that is hard when you are snorkeling. This is one journey that will make you want to scuba dive Aruba. Regardless of the way you get to the shipwrecks, there is no doubt the shipwrecks must be part of your plan to Snorkel Aruba. You will not be disappointed.